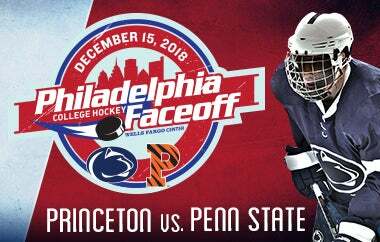 Penn State University will battle Princeton University during the Philadelphia College Hockey Faceoff at Wells Fargo Center on Saturday, December 15. Tickets go on sale on Tuesday, June 12 at 10 a.m. exclusively online at WellsFargoCenterPhilly.com, by phone at 1-800-298-4200, or in person at Wells Fargo Center box office. Penn State, making its sixth appearance on the Wells Fargo Center ice, returns to Philadelphia for the first time since a heartbreaking 5-4 setback against this same Princeton team a mere 23 months ago. Since their last trip to the City of Brotherly Love, the Nittany Lions captured the 2017 Big Ten Tournament Championship and have reached back-to-back NCAA Tournaments, compiling a 43-27-7 record over the past two seasons. Holy Ghost Prep alumni standouts Peyton Jones (Langhorne, Pa.) and Kevin Kerr (Bensalem, Pa.) will be making a return trip close to home while Penn State sophomore Evan Barratt (Bristol, Pa.) will don the Blue and White for the first time in his own backyard come December 15. Head Coach Guy Gadowsky will be facing his former Princeton team for the third time since becoming Bench Boss of the Nittany Lions in 2011. Princeton, the 2018 ECAC Tournament Champions, finished the 2017-18 season with a 19-13-4 overall record, advancing to its first NCAA Tournament since Gadowsky led Tigers to back-to-back tournament appearances in 2008 and 2009. The reigning ECAC Hockey Champion Princeton team was one of the hottest in the nation during the second half of the 2017-18 team, finishing on a 13-3-1 run and a bid to the NCAA Tournament. Princeton won the ECAC Hockey league as the No. 7 seed, dispatching the No. 1, 2 and 3 seeds en route to the Whitelaw Cup. On top of finishing with the nation’s best power-play unit, Princeton had the second-best scoring offense, averaging 3.64 goals per game. A pair of Tigers earned second-team All-America honors with Max Véronneau leading the nation in assists per game and Ryan Kuffner ranking second in goals per game. Classmate Josh Teves led the nation’s defensemen in scoring, and all three return for their senior seasons in 2018-19. In total, 73 percent of Princeton's scoring production returns with the addition of seven incoming players - three of which have been on the NHL Central Scouting List. Hosting high caliber hockey events and programs to grow the sport of hockey in Greater Philadelphia is no new concept to Comcast Spectacor and the Philadelphia Flyers. Over the last few years, Comcast Spectacor has successfully hosted the 2014 NHL Draft, the 2014 NCAA Frozen Four, the 2012 NHL Bridgestone Winter Classic, the 2010 Stanley Cup Final and a number of college and professional hockey games.